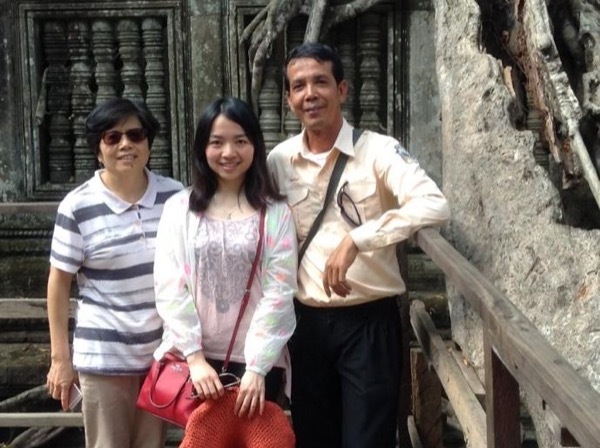 Traveler Reviews for Private Tour in Angkor Wat, Cambodia by Tour Guide Sotath T.
About Sotath T. Message Sotath T.
Sotath is a kind, gentle man who showed us important sites at Angkor Wat. He was knowledgeable, patient, and accommodating to our photographic needs. He picked us up at our hotel two hours before sunrise so that we could get prime location at the temple site for excellent photos of sunrise and sunset. He was flexible with the schedule to adapt to our needs. I highly recommend him as a guide if you want in-depth knowledge of this ancient city. We took 2 day Angkor tour. Sotath was great; he made us feel instantly comfortable. He was knowledgeable & spoke good English. He was always on time & we saw all the sights on itinerary. He tailored the tour to our needs; we added Beng Mealea which is out of town & skipped the floating village & lake. He never made us feel rushed & gave us time to explore. He also accommodated sunset & sunrise. I would recommend Sotath & this tour to anyone who wants to experience the highlights of Angkor temples. Wonderful guide, very knowledgeable about history of Cambodia, pleasant, honest, good English, flexible always putting my needs and wishes first. We packed so much into our time together from sunrise views to sunset views! It was fabulous! Activities from visiting beautiful historical temples to Kulan Mountain, boating Tole Sap Lake to see floating village, to hiking Kbal Spean, wonderfully delicious lunches, and cultural stops along the way to learn about Cambodian way of life. Excellent tours! Excellent guide! Sotath was incredible and knew not only how best to get around but provided great background about all the key sights. He is a seasoned guide and you could tell by how he could anticipate our needs. It was a pleasure to meet him. Enjoyed our angkor wat trip with our tour guide and driver. Excellent services provided with lots of love and patience. We had a two day tour with Sotath of Angor Wat. Sotath is an extremely professional and knowledgable guide. He is very well educated and has an encyclopedic knowledge of Angor Wat and Cambodia which he shares willingly. Sotath picked us up on time both days and drove us around Angor Wat and the surrounding area. He provided an excellent description of the various sites and responded to all of our questions. Sotath also took us to excellent restaurants for lunch. I highly recommend Sotath as a guide. Sotath was friendly and very knowledgeable. Though 2 of the 4 of us had to miss a part of the tour, he skillfully guided us so we didn't miss any of the important sights hence we had beautiful memories to bring home! Thank you Sotath for an excellent job! Our guide, Sotath exceeded our expectation by a large margin. We are photographers and our need differ from the normal tour business. We need flexibility, go early and stay until sunset and need the good advise where to go Sotath did all this but more, he was the perfect photo assistant, even though he did not do this before. Sotath is highly educated from international universities. Accordingly, his knowledge and his English are really outstanding. I highly recommend Sotath to everyone. I was very impressed with my guide's knowledge of the different temples and also of the local area. He was patient and helpful. He was also flexible. He suggested changes to take advantage of good weather.I enjoyed the two days we spent together. This tour met my every high expectation. Sotath was on time at the airport, he took us around in a very comfortable van, he was knowledgeable about every temple, he added information everywhere we visited. Some have commented that Sotath is hard to understand. There were a few times that we asked him to repeat information, but he was always careful to tell us until we understood. May of the names are difficult, but he would repeat them slowly. I have only high praise for him and our driver. We had a great time visiting the Temples of Angkor Wat with Sotath as our guide. He led us through several temples with a trip to the Floating Village of Tonlé Sap. He provided rich details on all we saw, sharing his deep knowledge of history and culture. He is kind and very attentive to his clients' needs (we SO appreciated his clean, air-conditioned vehicle). My wife and I are photographers & he suggested great shots and even took some treasured family photos. Great guide - wonderful experience. Would like to comment on our guide Sotath who guided us around the temples of Angkor Wat. He was extremely knowledgable with his history lessons and certainly looked after us in a professional And kind manner. Highly recommended. The only downside was the heat and humidity, he suggested Travelling between November and February for a more enjoyable time. Many thanks we had a great time. Outstanding tour to breathtaking sights! Sotaths commentaries were very informative and descriptive, greatly enhancing my knowledge of the park. Two days provided a pacing that was not overwhelming. I had enough time to wander and explore what interested me. Sotath made our visit a lot more pleasurable and meaningful. He is well versed in English & can even say a few phrases in Mandarin. As I brought my elderly father along, Sotath was very most accomodating, ensuring at all times that my father was comfortable, and that he wasn't walking too fast. His car was immaculate and air conditioned, and his driving was very careful. He was always on time, courteous, gave us a lot of good information about the area and the temples. Having a guide saves a lot of time. Outstanding Guide - very helpful in all aspects of tour - wonderful air conditioned car - extremely helpful in finding restaurants and stores that had good value for the price - Sotath has excellent knowledge and willing shares answers no matter the question - speaks excellent English - Most highly recommend Sotath as your tour guide. Sotath was excellent, his English was easily understood, he was punctual, clean, personable, and exceptionally kind. Knowing that I have walking problems, he always asked the gate officials for permission to drive me close to the temples, enabling me to see as much as possible despite my handicap. His knowledge of the sights was appreciated, his extra stops for camera problems, to replenish cool water for all of us, and to show us local habitats and animals added to our enjoyment and comfort. Just returned from a 5 day trip to siem reap in which we availed the guide services of Sotath for a two day guided tour of angkor wat. Sotath was very accommodating as well as very knowledgable about the temples and any other questions we had about Siem Reap culture. Booking a private tour made it easier to set our own pace and itinerary and our guides personable nature and professionalism helped to make it a memorable experience. I would highly recommend using this service. Thank you for a great tour. Very good experience! Sotath speaks very good English so we could easily understand his explanations. His broad knowledge on Cambodia allow him to answer all our questions on the temples and the country's history. The car is in excellent conditions and the effective AC was essential to enjoy the tour. It was very hot! Only suggestion: during the end of the tour the explanations were not as complete and more information would be nice. He recommended an excellent restaurant for launch in Siem Reap!